Another, really simple equation... and yes it works and is used constantly to ensure proper sizing. The equation determines the way that we measure an electrical systems ability to do work. The power stays the same,500W, for various voltages and currents and that gives design choices for various systems. Current determines the size of conductor needed http://www.powerstream.com/Wire_Size.htm higher current requires bigger(more expensive) wires. Voltage is typically determined by the system(battery, generator, turbine). Higher voltage requires more insulation and spacing to contain(Isolate from the environment and earth ground) the electric potential. 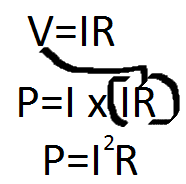 Typically, I approach power ratings by solving for the current through the known resistance and then use this formula. I use this form when calculating required voltage rails to deliver power to a known load like a resistor. Power draw is a major factor for determining if something is practical. Putting a 4 ohm load on a battery is going to drain the battery very quickly. Delivering power to a 4ohm speaker involves a power amplifier and is purpose driven. So how do voltage and current relate when there isn't a physical resistor? The answer is that "active" devices work on currents drawn from a fixed voltage supply. Active devices are devices who's operating parameters can be changed electrically. Resistors, Capacitors and Inductors are passive devices.